Company enters a seasonally weaker time of year. Are estimates pricing in too much improvement? Currencies, interest rates could impact bottom line. With just about two weeks to go until technology giant Apple (AAPL) reports its fiscal second quarter, everyone is starting to get their estimates together. Since management decided to stop reporting unit sales, some of the numbers seem a little harder to predict. Today, I want to take a look at some recent history, because some seasonal trends and other items make me slightly worried going into this month's report. As we move into the summer months, Apple enters a traditional weaker time of the year. Generally speaking, iPhone sales decline before a new line of phones launches in September, and other products with a similar launch timeline see the same pattern. 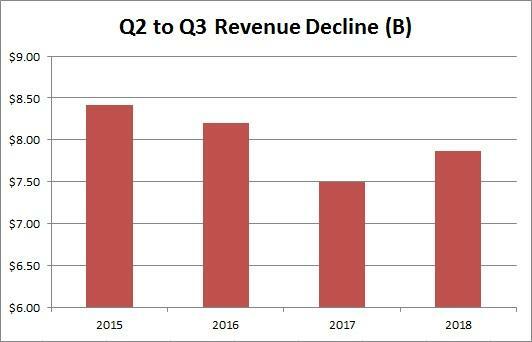 In the chart below, you can see how overall revenues have declined by an average of $8 billion from the March to June quarters over the past four years. Now, the numbers above may not be a surprise, but when you take a look at current analyst estimates, that's where the situation gets a bit tricky. The street is looking for $57.51 billion in the March quarter and $52.22 billion in the June quarter, a difference of about 5.3 billion. The March period estimate is currently half a billion dollars above Apple's guidance midpoint of $55 billion to $59 billion for the period. Let's compare last year to this one. Apple launched a new $329 iPad late in the March period in 2018, but not this year, instead going with a new upgraded iPad mini and a larger screen version that went for less than a Pro version with the same screen size. Last year, Apple launched the HomePod early in the year, while this year, it got a price cut, and this year, we saw the second generation AirPods come. Apple also launched its subscription News service a few weeks ago. So, perhaps, this year, we may only see a decline of say $6 billion to $7 billion sequentially. However, knowing how management gives a wide guidance range and likes to be conservative, let's subtract that $7 billion figure from the fiscal Q2 guidance. That would imply a range of $48 billion to $52 billion for the June quarter, which would be quite disappointing when compared to the street consensus currently. Consider the fact that the US Dollar Currency Index has strengthened by a percent since Apple reported in late January, and that provides another headwind to the top line. Unfortunately, there's a similar pattern when it comes to bottom line estimates, even though Apple doesn't provide true EPS guidance. The last four years have seen an average decline of $0.45 per share sequentially, but the street only expects a $0.25 decrease right now. With Apple reducing its net cash pile and interest rates coming down at the moment, the company won't generate as much interest income in the near term, which could impact things by a few cents per share. Don't forget, the bar for Apple is a bit higher this year, even after that massive revenue warning back in early January. While the company is forecast to report a nearly 6% year-over-year revenue decline for fiscal Q2, less than a 2% decline is called for in fiscal Q3. Last year, Apple saw a higher revenue growth rate in Q3, primarily thanks to iPhone revenues up 20% year over year compared to a 14% rise in Q2. Last year's sequential increase in the revenue percentage change was almost 175 basis points, but analysts are looking for a nearly 400 basis point rise this year. We also don't have a China trade deal in place yet, which may continue to provide a headwind in that key market. The big question here is what will investors really focus on the most? Let's hypothetically say that history repeats and guidance is below expectations as I've detailed it could be. Will that potential news be offset by a potentially large dividend raise as well as an increase to the buyback that we should see at this report? Remember, too, that Apple shares are up more than $44 since the January report as seen in the chart below. That could set up a buy the rumor, sell the news event for earnings. In the end, history would tell us that Apple may be about to disappoint when it comes to fiscal third quarter guidance. The average revenue decline over the past four years has been $8 billion sequentially, but the street only sees about two-thirds of that coming, with a similar EPS story. With the China trade war not settled, the US dollar still rising, interest rates, and cash coming down, and management being slightly conservative as usual, I wouldn't be surprised if guidance is soft. The key question for investors, with a stock that's soared between reports, is can a dividend raise and buyback offset some bad news? What do you think? I look forward to your comments below.